It can Open TIM and BMP files. 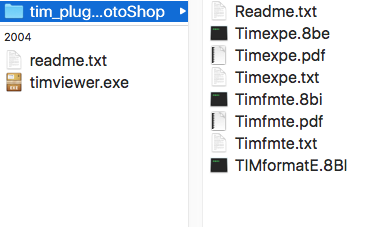 Can convert single or multiple file from tim->bmp and vice versa. It can also scroll through multiple CLUTs and can view the current CLUT. The best feature in it though is that it can scan, extract, and insert tim files back into a file (not the cdimage; For a cd image you must extract the raw files from it, then use this program on the raw files and, once done, re-insert the raw files back into the cd image). Plug-ins for Adobe Photoshop, versions 2.5 and 3.0. *readme.txt - Overview of Abobe directory contents.